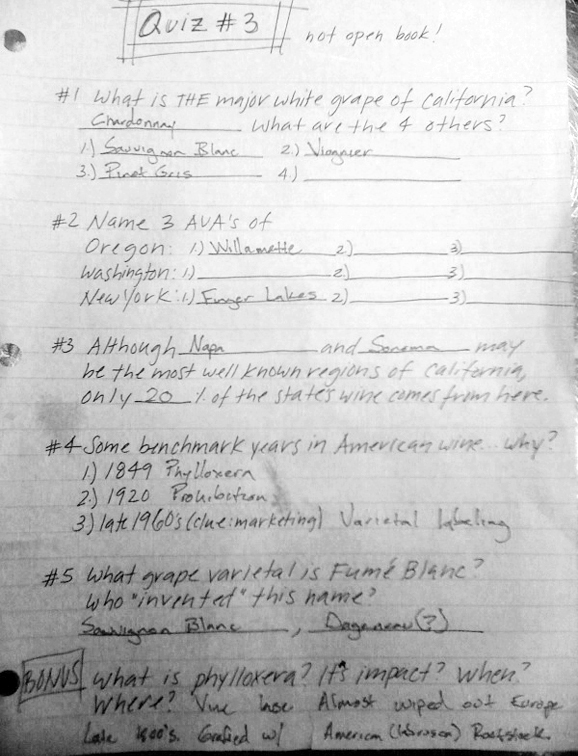 Here are my answers to Quiz #5. I actually do miss doing these, and until the other day forgot that We used to do this. Anyhow, I’m pretty certain about #’s 1, 2, 6 and 8. The wording of question #5 confused me. If you were looking for the answer “are”, then I think this should have been a 2-part question, with the second half being True or False. I will test you on giving tests soon. I left a few blank because I really had no idea. I could have guessed, but, oh well…. Believe it or not, He actually asked for it. And I’m happy He did. Over the last couple of months We’ve fallen out of the wine ritual that prompted us to start this blog. 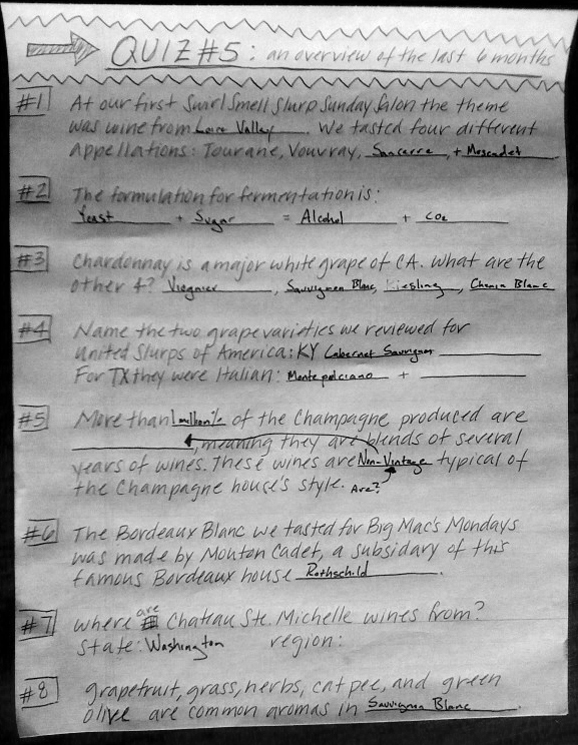 We would pick a chapter in any of the various wine books We collectively own, buy a bottle of wine from the region or grape varietal discussed in the book, and then have a mostly serious tasting and discussion about the wine. 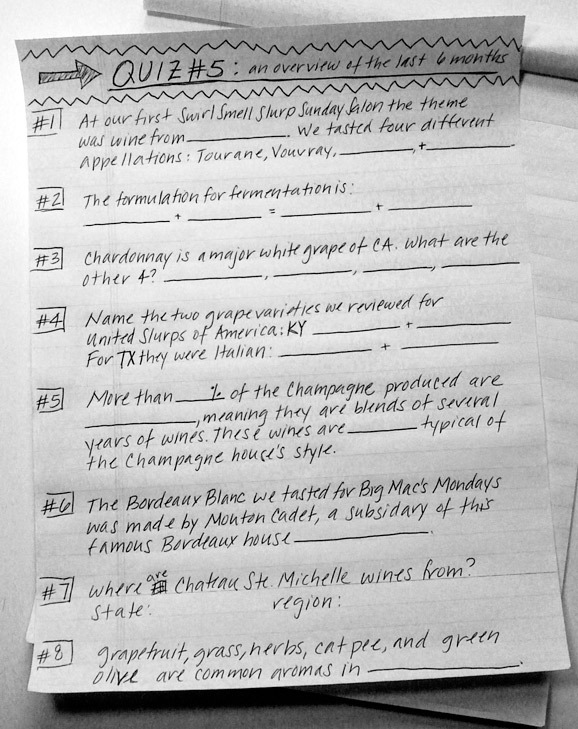 Once We started the blog, We would often incorporate the ritual into our Big Mac’s Mondays and Wines of Note posts. Every few weeks I’d quiz him on the chapters We had tasted and read. 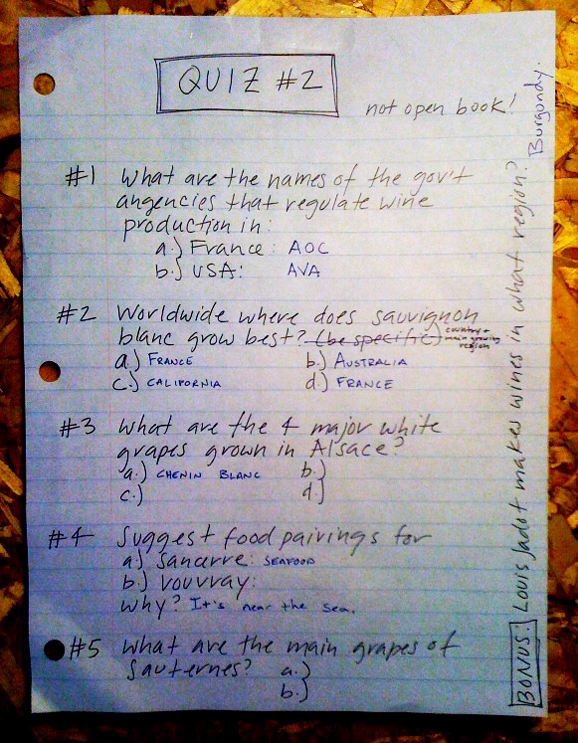 Sometimes He got really into and did very well on the quiz. Other times He did not (and accused me of being mean). 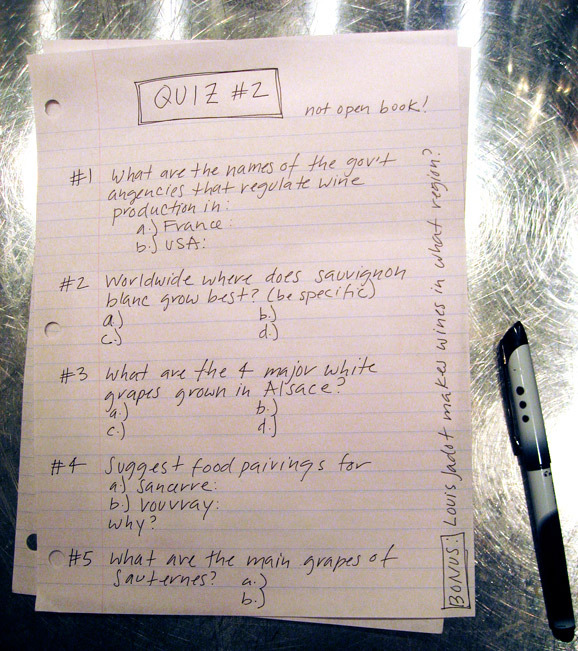 Either way, the quizzes were a useful way for Us to both review what We had read and tasted. This reading/drinking/discussing/quiz ritual has been been missed by Us both. 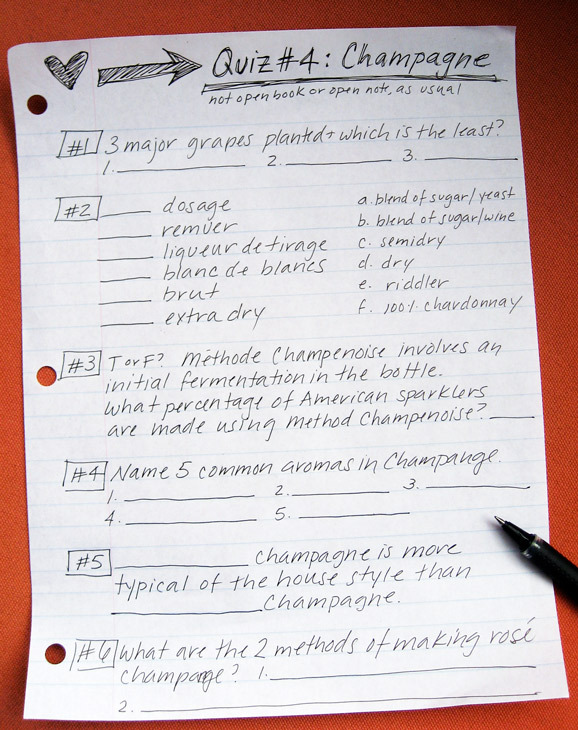 We’ve vowed to reestablish it into Our wine education, starting with a general quiz for Him, covering some of what We’ve studied so far. Thinking of Valentine’s Day and what to drink, like so many others I choose Champagne. Oh how I love Salon. Then again, in the spirit of the holiday, maybe a Nicholas Feuillatte rosé would suit me better. And then I started thinking about how nice it would be to receive a box of delicious, decadent dark chocolate…so perfect with a luscious, nutty Madeira. Or a tawny Port. Which made me think about PX and having a generous pour over vanilla bean ice cream. Bubbles and sweets and sweet wines on my mind. 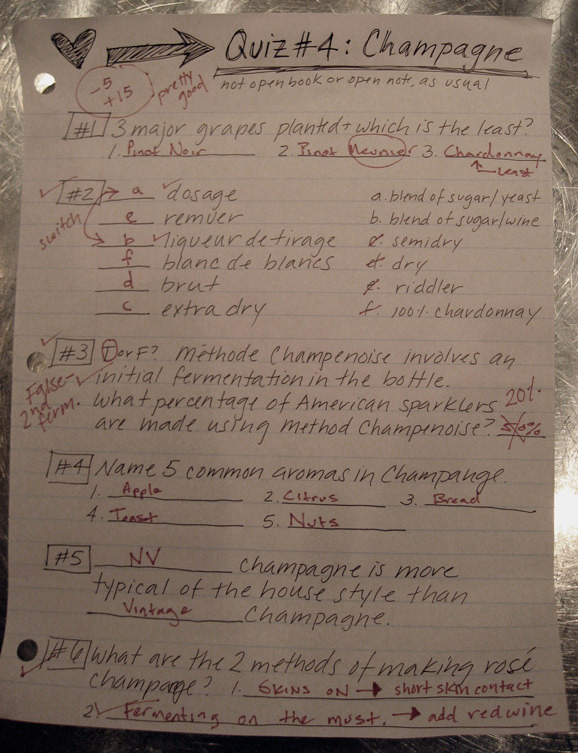 When I proposed a Champagne, Port, Sherry, and Madeira wine lesson and quiz He wasn’t as wooed as I was. In fact he yelled at me. “What??? That’s too much. No way.” So back to Champagne. 2. I should have known Walla Walla and Columbia Valley. I just forgot. I have had Chateau Ste. Michelle Riesling, should have known this. 3. It’s 15% not 20%. Fair enough. I knew it was small. 4. ’49, gold rush, should have maybe put that together. 5. I didn’t know who gave it the name, but knew it was SB. This test was actually fun. 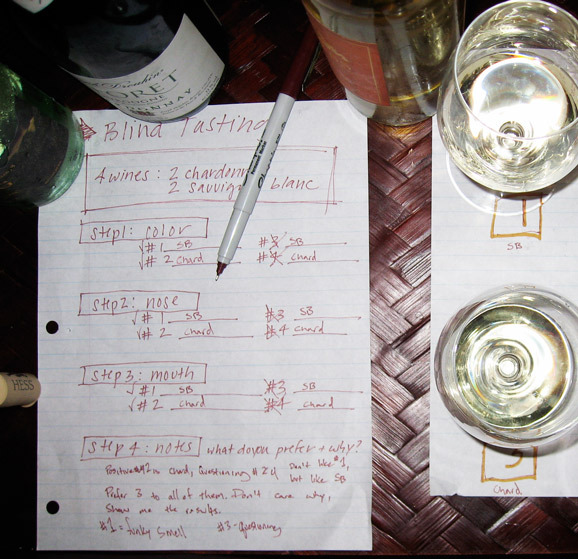 Tasting is an essential part of The Wine Education, obvs, and we do a lot of it. But beyond all the slurping we are also learning (Him) and reviewing (Her) about growing regions, grape varietals, vinification, the history of wine, etc. Our ritual is to read to each other from various wine books (typically He slowly reads aloud and She interrupts Him with additional facts, asides, or questions) and then we taste a bottle or four described in the chapter we’ve read. “I think I can finally tell the difference between sauvignon blanc and chardonnay. I know I can,” He declared. 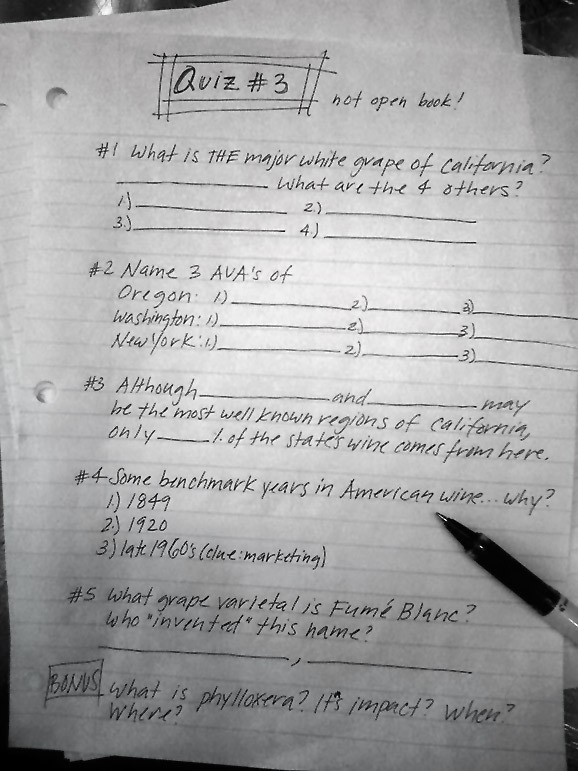 Okay…so here’s a test for Him. I selected four bottles from John and Pete’s (an excellent wine and spirits store in West Hollywood–go there). 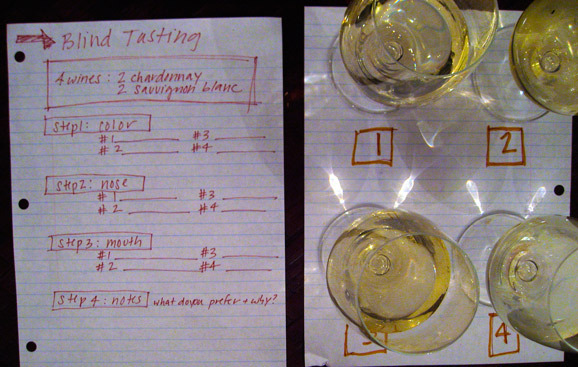 I presented the wines blind and asked him to go in four steps: color, nose, mouth, and preference. Were you mad at me when you made this quiz? I feel like I haven’t learned any of this yet. Really? The four grapes of Alsace and the grapes of Sauternes? I might need some help from our readers in the comments.